, a distinguished writer, was born in 1636, at Plymouth in Devonshire, where he probably received the first rudiments of his education, and was entered at Exeter-college, Oxford, April 19, 1652. He was placed under Samuel Conant, an eminent tutor, and having made great proficiency in his studies, he proceeded B. A. Oct. II, 1655. The following year, he removed to Lincoln-college, probably upon some view of preferment. | Taking the degree of M. A. June 29, 1658, he assumed the priestly office, according to the forms used by the sectaries at that time, and became chaplain to Francis Rouse, esq. then made provost of Eton-college, by Oliver Cromwell, and designed for one of his house of lords. Had tin* patron lived a little longer, Glanvil’s expectations would, no doubt, have been fully answered; since according to Wood, he entirely complied with the principles of the then prevailing party, to whom his very prompt pen must needs have been serviceable. But Rouse dying the same year, he returned to his college in Oxford, and pursued his studies there during the subsequent distractions in the state. About this time, he became acquainted with Mr. Richard Baxter, who entertained a great opinion of his genius, and continued his respect for him after the restoration; when they espoused different causes. The friendship was equally warm on Glanvil’s side, who, Sept. 15, 1661, addressed an epistle to his friend, professing himself to be an admirer of his preaching and writings; he v also offered to write something in his defence, but yielded to his advice, not to sacrifice his views of preferment to their friendship. Accordingly, he had the prudence to take a different method; and turning his thoughts to a subject not only inoffensive in itself, but entirely popular at that time, viz. 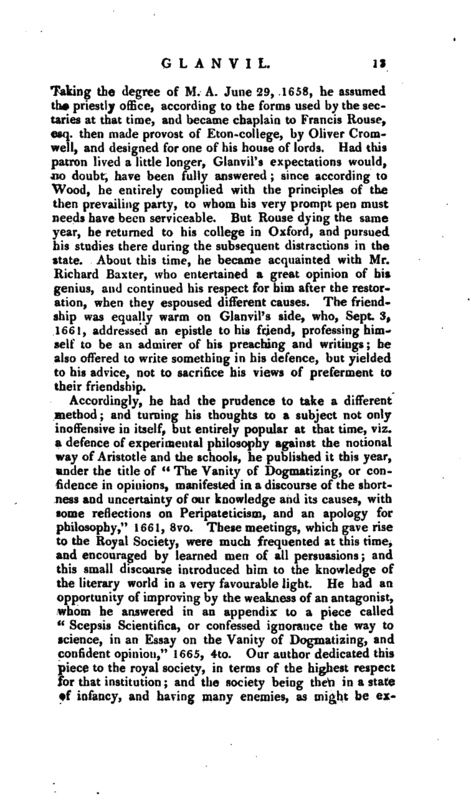 a defence of experimental philosophy against the notional way of Aristotle and the schools, he published it this year, under the title of “The Vanity of Dogmatizing, or confidence in opinions, manifested in a discourse of the shortness and uncertainty of our knowledge and its causes, with some reflections on Peripateticism, and an apology for philosophy,” 1661, 8vo. These meetings, which gave rise to the Royal Society, were much frequented at this time, and encouraged by learned men of all persuasions; and this small discourse introduced him to the knowledge of the literary world in a very favourable light. He had an opportunity of improving by the weakness of an antagonist, whom he answered in an appendix to a piece called “Scepsis Scientifica, or confessed ignorance the way to science, in an Essay on the Vanity of Dogmatizing, and confident opinion,” 1665, 4to. 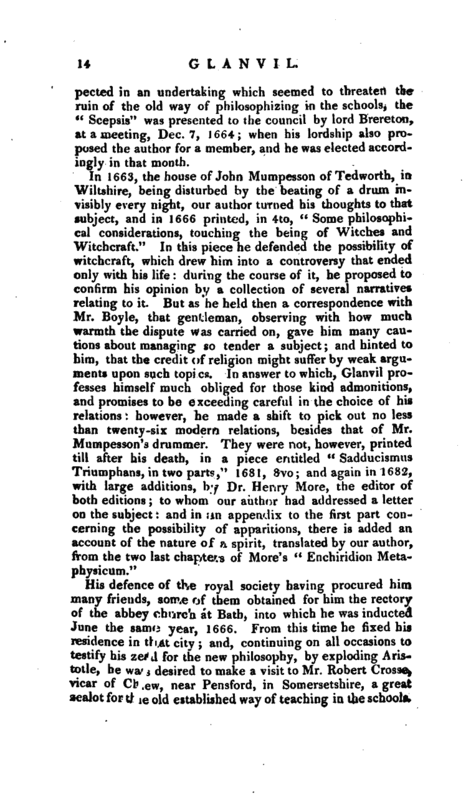 Our author dedicated this piece to the royal society, in terms of the highest respect for that institution; and the society being then in a state ef infancy, and having many enemies, as might be | expected in an undertaking which seemed to threaten the ruin of the old way of philosophizing in the schools, the “Scepsis” was presented to the council by lord Brereton, at a meeting, Dec. 7, 1664; when his lordship also proposed the author for a member, and he was elected accordingly in that month. His defence of the royal society having procured him many friends, some of them obtained for him the rectory of the abbey church at Bath, into which he was inducted June the same year, 1666. From this time he fixed his residence in that city; and, continuing on all occasions to testify his zeal for the new philosophy, by exploding Aristotle, he was desired to make a visit to Mr. Robert Crosse, vicar of Chew, near Pcnsford, in Somersetshire, a great zealot for the old established way of teaching in the schools. | Our author accepted the invitation, and going to Pensford in 1677, happened to come into the room just as the vicar was entertaining his company with the praises of Aristotle and his philosophy. After their first civilities were paid, he went on with his discourse, and, applying himself to Mr. Glanvil, treated the royal society and modern philosophers with some contempt. Glanvil, not expecting so sudden an attack, was in some measure surprized, mud did not answer with that quickness and facility as he otherwise might probably have done. But afterwards, both in conversation and by letters, he attacked his antagonist’s assertion, that Aristotle had more advantages for knowledge than the royal society, or all the present age had or could have, because, “totam peragravit Asiam,” he trarelled over all Asia. 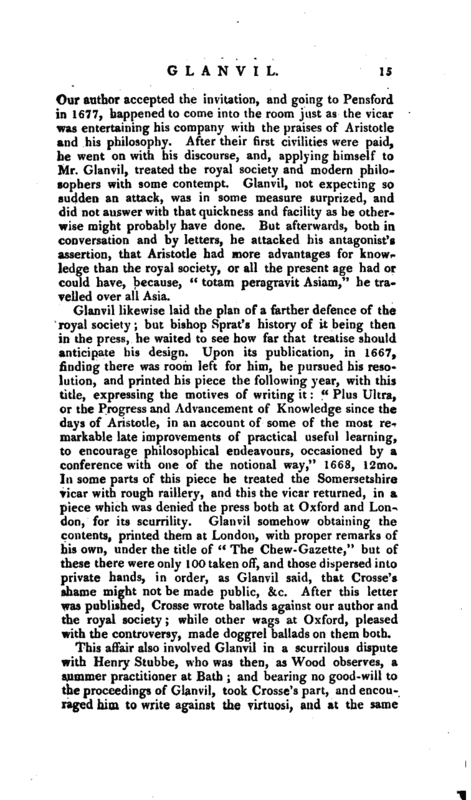 Glanvil likewise laid the plan of a farther defence of the royal society; but bishop Sprat’s history of it being then in the press, he waited to see how far that treatise should anticipate his design. Upon its. publication, in 1667, finding there was room left for him, he pursued his resolution, and printed his piece the following year, with this title, expressing the motives of writing it: “Plus Ultra, or the Progress and Advancement of Knowledge since the days of Aristotle, in an account of some of the most remarkable late improvements of practical useful learning, to encourage philosophical endeavours, occasioned by a conference with one of the notional way,” 1668, 12mo. In some parts of this piece he treated the Somersetshire yicar with rough raillery, and this the vicar returned, in a piece which was denied the press both at Oxford and London, for its scurrility. 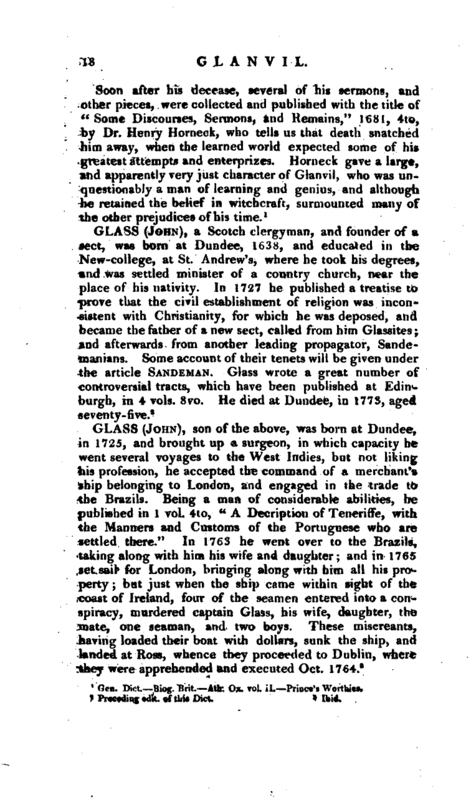 Glanvil somehow obtaining the contents, printed them at London, with proper remarks of his own, under the title of “The Chew-Gazette,” but of these there were only 100 taken off, and those dispersed into private hands, in order, as Glanvil said, that Crosse’s shame might not be made public, &c. After this letter was published, Crosse wrote ballads against our author and the royal society; while other wags at Oxford, pleased with the controversy, made doggrel ballads on them both. 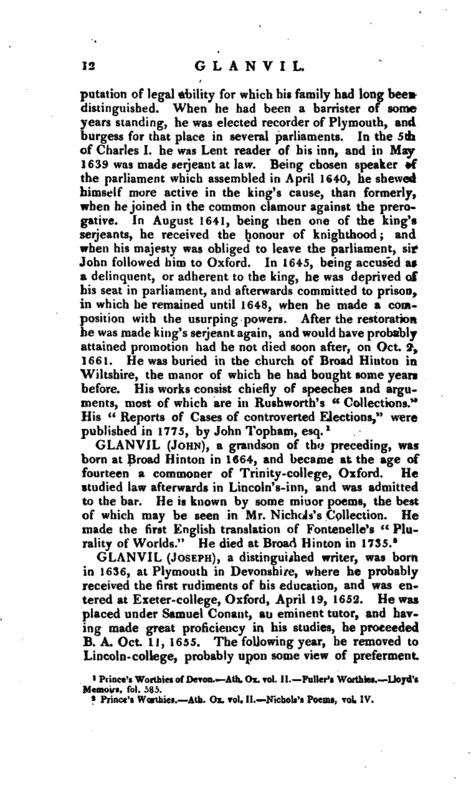 This affair also involved Glanvil in a scurrilous dispute with Henry Stubbe, who was then, as Wood observes, a summer practitioner at Bath; and bearing no good-will to the proceedings of Glanvil, took Crosse’s part, and encouraged him to write against the virtuosi, and at the | time entered the lists himself and the follpwing pamphlets passed between them. I. “The Plus Ultra reduced to a Nonplus,” &c. 1670, 4to, Stubbe. 2. “A prefatory Anwer to Mr. HenryStubbe, the doctor of Warwick, wherein the malignity, &c. of his Animadversions are discovered. 1 * 1671, 12mo, Glanvil. 3.” A Preface against Ecebolius Glanvil, F. R.S. subjoined to his Reply, &c. Oxford,“167 I, 4to, Stubbe. 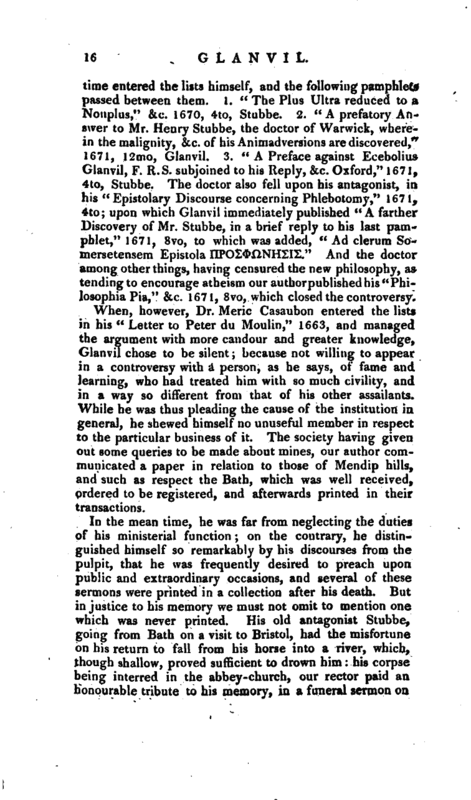 The doctor also fell upon his antagonist, in his” Epistolary Discourse concerning Phlebotomy,“167 t, 4to; upon which Glanvil immediately published” A farther Discovery of Mr. Stnbbe, in a brief reply to his last pamphlet,“1671, 8vo, to which was added,” Ad clerum Somersetensem Epistola Προσφωνησισ.“And the doctor among other things, having censured the new philosophy, as tending to encourage atheism our author published his” Philosophia Pia,“&c. 1671, 8vo, which closed the controversy. When, however, Dr. Meric Casaubon entered the lists in his” Letter to Peter du Moulin," 1663, and managed the argument with more candour and greater knowledge, Glanvil chose to be silent; because not willing to appear in a controversy with a person, as he says, of fame and learning, who had treated him with so much civility, and in a way so different from that of his other assailants. While he was thus pleading the cause of the institution in general, he shewed himself no unuseful member in respect to the particular business of it. The society having given out some queries to be made about mines, our author communicated a paper in relation to those of Mendip hills, and such as respect the Bath, which was well received, ordered to be registered, and afterwards printed in their transactions. 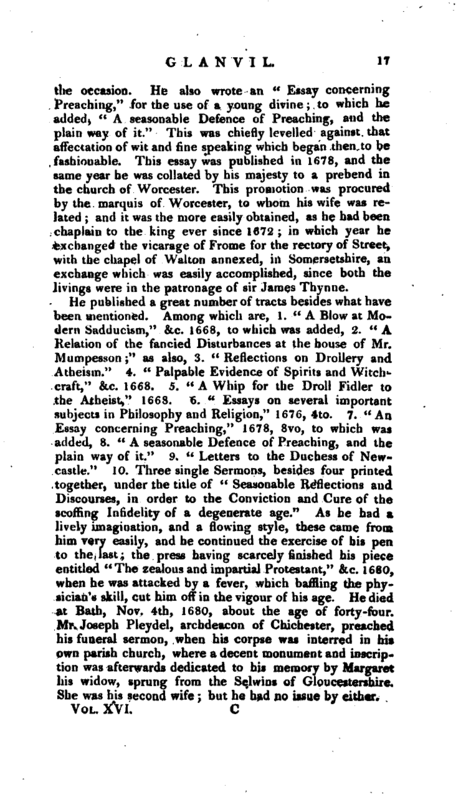 In the mean time, he was far from neglecting the duties of his ministerial function; on the contrary, he distinguished himself so remarkably by his discourses from the pulpit, that he was frequently desired to preach upon public and extraordinary occasions, and several of these sermons were printed in a collection after his death. But in justice to his memory we must not omit to mention one which was never printed. His old antagonist Stubbe, going from Bath on a visit to Bristol, had the misfortune on his return to fall from his horse into a river, which, though shallow, proved sufficient to drown him: his corpse being interred in the abbey-church, our rector paid an honourable tribute to his memory, in a funeral sermon on | the occasion. He also wrote an “Essay concerning Preaching,” for the use of a young divine; to which he added, “A seasonable Defence of Preaching, and the plain way of it.” This was chiefly levelled against that affectation of wit and fine speaking which began then to be fashionable. This essay was published in 1678, and the same year he was collated by his majesty to a prebend in the church of Worcester. This promotion was procured by the marquis of Worcester, to whom his wife was related and it was the more easily obtained, as he had been chaplain to the king ever since 1672 in which year he exchanged the vicarage of Frome for the rectory of Street, with the chapel of Walton annexed, in Somersetshire, an exchange which was easily accomplished, since both the livings were in the patronage of sir James Thynne. Gen. Dict. Biog. Brit. —Ath. Ox. vol. II. Prince’s Worthies.